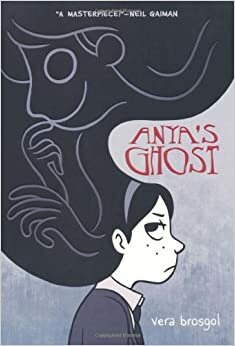 Today I will be reviewing Anya's Ghost by Vera Brosgol. It's the story of a Russian-American girl who falls down an abandoned well. In that well, she finds a ghost of a girl who fell down the well in 1918. The rest of the story follows what happens when that ghost comes to live with her. I really like this book because all of the characters are very realistic. Anya’s mom is friendly but not overly friendly. The six-year-old brother isn't a stereotype of the annoying brother. I really love how the jocks and cheerleaders aren't the stereotypical bullies they're portrayed to be in other stories. 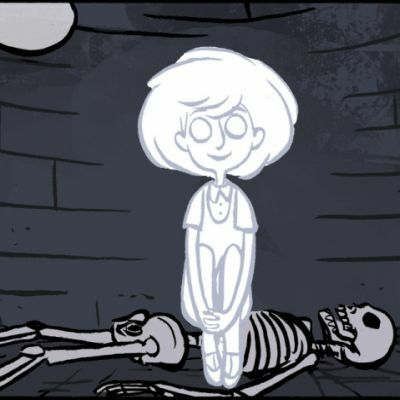 One scene I love is when Anya first meets the ghost. She wasn't afraid, but the ghost was so friendly that I don't think I would have been either. I really love how Anya treats the ghost the same way she treats her little brother. When the ghost tried to touch some of her food, Anya snatched it away and glared at her. 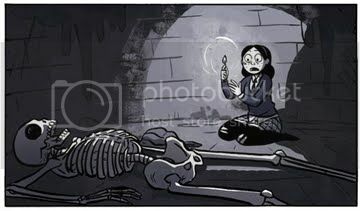 Anya’s view of the ghost changes a lot throughout the course of the book. At first, she's distrustful of the ghost. She keeps her distance and constantly snaps at her, but when she sees the possible gain she could have from being friends with the ghost, she starts warming up to her. I absolutely love the art in this book. It's thick like it was painted or drawn with a marker. 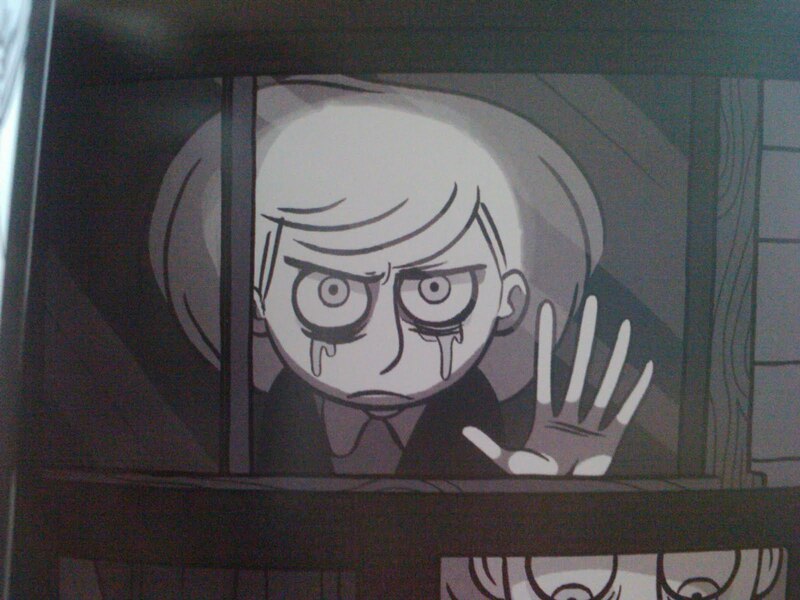 It looks somewhat like the art style in Scott Pilgrim. The ghost is one of the best looking things in the book. She has hair that looks like a dandelion and big blank eyes. I also like the way the little brother looks. He has a big grin and huge shiny eyes, which is perfect for someone of his clueless character. He looks like a puppy dog trying to figure out what his master wants him to do. I think that Anya's Ghost is appropriate for all ages. There is no violence or inappropriate scenes. The art is beautiful, the characters are interesting, and the story is intriguing. Halloween is coming up, and this is a ghost story different from any you've heard of before. MUAhAHAhaHaHA! I would give Anya's Ghost 8 spoooooky ghosts out of ten. Oh, thank you for this recommendation! I'm always looking for high-quality graphic novels for my kids and this looks like something they'd enjoy. "It's thick like it was painted or drawn with a marker." It created a really smooth and rich feel, which fit with the dreamy, ghost-y story. Thank you for identifying exactly why the art was so appealing to me. "MUAhAHAhaHaHA!" Love the spooky laugh! I have never heard of this one. Will go check it out. Looks good. Great review, Milo! Now I've got to find it, wherever it's lying around, and read it for my own self (but maybe not before bed if it's too scary). MUAhAHAhaHaHA! Thanks Milo! Now I know what to get my grandson for his birthday! And I'll read it before I send it, hahah. Your Alabama Fan! this sounds like a good one and something different, will check it out for my 11yo son.